Hey everyone! This is Mik and Brandon and together we started Adventure Kooks- just a little bit about us- we are both from Ventura County, CA and have been living in Utah for the past few years and we are loving it! Utah is where most of our adventures and voyages take place, but we are excited to visit and discover new places too! Things that we are doing now began because of our love for the outdoors and the relationship we’ve created with each other. Newly married, Brandon and I have always felt pretty eager and ready for adventure. It seemed like all we could think about was the amazing plans we were constantly making. Which place to climb, what mountain to ski, what we were going to do next. We’ve been captivated for quite awhile by the idea of the van life and the freedom that it offers. While going to school full time and working, we have not had the mobility that we crave- so we constantly dreamed about the future when Brandon would graduate and we would go on our dream ski trips. It was all just dreams until Brandon found an ad on KSL. We drove two and a half hours just to take a look and ultimately drove home late that night with what has been the greatest purchase we’ve ever made (besides our two pups); Our 1994 Dodge Van. We have had the van for almost a year now and during that time she’s made her voyage from the great Wasatch Mountains of Utah to the Southern California Coast and back again. Those trips we took really showed us the improvements we could make with the van and we started a pretty hefty remodel in the middle of summer. It hasn’t been easy and we are learning the amount of time it truly takes to dive into a project like this. 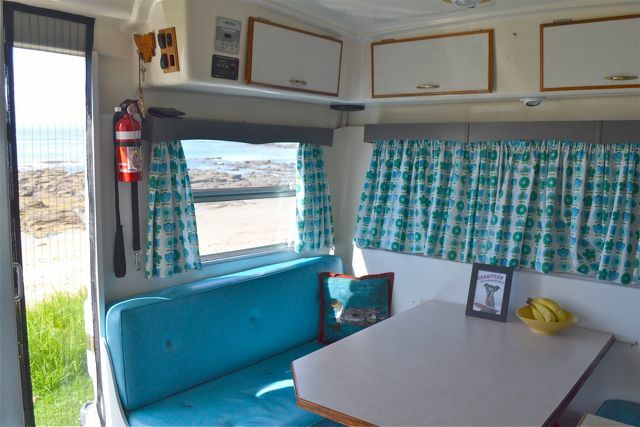 When we first bought our beloved ram van she had shag carpet- it seemed alright at first but we quickly realized that if we wanted to take her on ski trips and to the beach we needed something a little less water absorbent, that wouldn’t stay wet for several days after a trip. Since ripping out the carpet we have repaired the rusty floor of the van, cut outdoor carpet to be a barrier between the metal floor and the fresh new plywood above, laid down sheet vinyl for a more water proof interior, painted the wood paneling and kitchenette of the van, added a Goal Zero generator and paneling system and a Dickinson heater to keep the van cozy in the cold northwest winters. We hope to have everything complete by December because Brandon will be graduated and then its officially game on! We’re still pretty new to this community of adventure lovers and van enthusiasts, but we are digging every minute of it and we think what everyone is doing is so rad! It has inspired us in so many ways and has really encouraged us to take our passions to the next level. We can’t wait to show everyone the finished product of the van, share our adventures, meet more incredible people and add to the good vibes that we feel in this awesome community every day! To see more of what us and our two pups are up to follow us on Instagram @adventurekooks and feel free to keep in contact with us. We love hearing from everyone and getting to know you! Hi, we are two native Texans working on building our bus life in North America. We've done the whole traditional American lifestyle, chasing down your dream job and working 40+ hours a week. At twenty-five, we bought our second home, a home we thought was our dream home, where we thought we would raise a family. However; after the first few months, we realized that this life is the same as the one we traded it for. We wanted change and we knew that to really make the changes we wanted to, we needed a huge lifestyle shift. This is how we decided to build a tiny home in a school bus, our journey to bus life started June 13, 2015. We call our bus the School of Life, this is because it is going to take us on the greatest adventure of our life. An adventure that will be full of learning, discovering, growing, and awakening. Now, we are not naive, we understand that this bus is not going to be a cure all. It's not going to just create the change for us, rather push us in the direction where we have to create change from within. We see the bus as a way to get freedom from society, standards, and expectations by separating us from societies norms. The tiny home on wheels will grant us the freedom to travel and explore as far as the bus can take us, meet many amazing people, learn many valuable lessons, teach valuable lessons, and help as many people as we can. This life should be about giving and we want to have time to do things we are passionate about and spend less time working solely to earn money. We are still building the School of Life Bus, you can follow that process and find our more about us on our blog and on Instagram (@schooloflifebus). We will be moving into our bus hopefully within the next month or two, but we will not begin our journey on the road until after the new year. Lennart & Julian are two mates from Germany who are on an amazing Vanlife Adventure in North America. Thanks for sharing guys. Buying a van, fitting it out and traveling through North-America - a once in a lifetime road trip. That was our dream before we took a plane and left Germany. Our story is about making plans come true. Read, how we came to our rolling home by getting a passenger van and converting it to a camper. Our project started in Denver, Colorado. Luckily, we were able to stay in an apartment for the first couple of weeks from which some friends of us just moved out. Pretty early, we found out that a lot of used stuff gets bought and sold on Craigslist. So, what we did was a lot of searching the internet. On one hand we checked Craigslist daily. On the other hand we checked websites of local dealers. Two weeks after our flight to Denver we checked out a van at Denver Fleet, a car dealer who had advertised a van on Craigslist. It was the first and the last van we inspected in person. It was an extended 15-passenger van with windows. We did a test drive, talked to the dealer and discussed with him what our plans are. In the end we bought it and became proud owners of a Ford E-350. We left the seats at the dealer and started to plan the conversion into a rolling home. Because of the fact that we bought a passenger van there was no need to built in any insulation. That saved us time and work. As foundation for our upgrade we built a flooring made of OSB. That gave us the option to build up the whole construction on a wooden base. As a consequence we did not have to put a single screw into the body of the van. A back conversion to a regular passenger van is possible without any remains. After the flooring we built the bed and cabinets. The whole interior is made of OSB as well. It is cheaper compared to plywood and we like the rough look of it. Furthermore we didn’t have to treat the wood with paint or varnish. The bed frame is very versatile. It has four independent moving parts. As a result we can convert the bed to a bench in the front, a bench in the back and we can lift the head section if we want to. Also, we can access our storage under the bed easily. Furthermore we have a second board battery and an inverter to run our electrical equipment on 110 Volts. For example, we can dry our ski boots overnight and off the grid. As soon as we hit the road and lived in our van we figured out that we needed some improvements. Our stove had to be set up with all it’s hoses and connectors every time we wanted to use it. The cutlery and dishes were flying around in different boxes. We decided to build an all in one kitchen. Our kitchen is made of pretty lightweight and thin plywood. It is pretty portable and fits under our bed. We can pull it out at the back of the van. It’s possible to place it right behind the van or everywhere else. The kitchen holds cutlery, a pan, pots, a month’s supply of spaghetti, pesto, spices, all kinds of cans and other groceries. It also features a custom compartment for our coffee utensils like beans, coffee machine and a grinder. Another device of our van interior is a nice tiny sink. We made of a salad bowl which we found at a grocery store. It catches the water of our water tank and even has a drain. We are now able to clean our dishes easily. We have a lot of storage in our van. Nevertheless we were sure that we needed more. Each of us has two pairs of skis and a whole bunch of winter equipment. In summer we want to go surfing. Where would we put some surf boards? We needed a roof rack. We tried to get a nice roof rack for our van. Luckily, we stayed for a while at a friend in Oregon. He handcrafts training carts for sled dogs and they are made of steel. So, we had the chance to weld our own custom made roof rack. It will fit our surf boards, a cargo box when we want to add one and also doubles as a platform for videography. This is truly the trip of our lifes, we’re doing all of this with much blood, sweat and tears. If you like our project, we would be more than happy if you spread the word about it. Spending the majority of our time scouring the Australian coastline for marine debris and trash means that we rarely give ourselves the opportunity to head inland. Sticking to the coast like glue, we avoid detouring in fear of missing that perfect beach, that perfect wave … or in our case particularly, that one beach covered with plastic trash from distant lands. But there was one detour we could not miss while travelling down the WA coast – Karijini National Park in the Pilbara region. Travelling south from Broome the landscape is as harsh as you can imagine – long stretches of red dusty plains, only disturbed by the odd road train pummelling along the road towards you. You pull into Port Hedland and the heat is stifling, the coffee is overpriced, and your lack of hi-vis attire makes you immediately stick out as an outsider. This is definitely mining land and it isn’t much to write home about. Heading east from Port Hedland we drove for hours through dusty plains, the cruising speed of 90km/hr in our 1990 Troopy disgruntling the many road trains and mining vehicles. For hours it felt like we were headed nowhere – just dust and dirt for as far as the eye could see. Finally the flat plains gave way to rolling hills and the highway began to curve through a rolling gorge – the dramatic change in landscape was so swift that it took our breath away. Close to hitting nightfall, we pulled up in a rest stop that overlooked the surrounding valley and settled in for the night. There wasn’t a soul to be seen. The only reminder of society being the distant hum of road trains passing in the valley below. We clambered up on to our roof rack and sat amongst the jerry cans with a couple of cold brews to watch the sun set. It was the best rooftop bar in Australia. Waking at dawn the next day we headed off into Karijini, eager to clamber through the gorges we had heard so much about. Karijini is spectacular. Out of the long red desert plains, huge cracks in the earth’s surface open up creating long intersecting gorges where the land falls away. On top, the harsh desert climate is barren and stifling hot, but deep in the gorges, shadowed by the cliffs above, the environment becomes wet, lush and green. Creeks run along each gorge, creating a little oasis in the middle of this iron ore country. We spent the day exploring the gorges, climbing down at one end and wandering along until we reached the other end a few kilometres away. The waterholes in most of the gorges provided pleasant respite from the scorching sun. Our final walk was one of the highest graded walks and took us into one of the deepest gorges. The walk started with a steep descent down metal ladders – each rung hot enough from the sun to make holding on quickly uncomfortable. Reaching the bottom, we were surrounded by green bushland – the whirr of cicadas and grasshoppers in the air, along with the constant buzzing of flies, filled the gorge with life. As we started along the trail, creeks emerged and our entrance disturbed the many lizards heating themselves at the water’s edge. Soon the gorge narrowed and the cliff sides towered above us – we began to recall the warning signs about flash floods and wondered whether the rains might come at any minute. The trail makers led us criss-crossing across the creek, until there was no longer a ledge to keep dry on and we had to remove our shoes and wade through the icy waters. It felt like a true outback adventure. Once back on a bit of dry earth further down, the gorge opened into a huge amphitheatre, with naturally carved seating sloping up one side of the cliffs. Sitting there, surrounded by walls of earth and with only the blue sky above, you get a real sense of this being ancient land. There is an awe that hangs over this place and you feel like you are breathing in millions of years of evolution and life. The trail continued, past a long brown snake sunning itself on the rock, into the “spider walk” – a narrow crack in the earth. There is only one way along this part of the walk and that is to awkwardly shimmy along with one foot on each wall. The rocks, smoothed by years of rushing water, fall away beneath you into inky black water – sure, you wouldn’t die if you slipped in, but it would be a very rude shock to the system! At the end of the spider walk, the gorge opens into a cavern – the end of the trail. This is Kermit’s Pool – a deep plunge pool of black freshwater which then plunges over a waterfall into the next gorge along which visitors are restricted from accessing. Here in the cool of the carven, next to the deep water, the chill in the air seemed a million miles away from the harsh heat which hovered just 50 metres above us. As we climbed out of the gorge, arriving again at the desert’s surface – we felt like we had come back to the real world - the cool tranquillity of the bottom of the gorge felt like a distant memory. We’ve done hundreds of walks and hikes around Australia and Karijini stands our as one of the most memorable – the land of the Pilbara feels so ancient and calm. It is a feeling we will never forget. Step by step, I think back and reminisce over the month I spent in my van. I set out, destined for adventure, destined to find true serenity, and found it in so many different things, things that opened my eyes to the mystery the every little speck of life holds. Everywhere I looked there was something, a little something that completely blew my mind could even exist, let alone that I could see it. I wanted to have an open mind, to see everything as if it were for the first time. Starting off the trip one afternoon, straight after work, I jumped in the readily-packed van, turned the music on and headed off, immediately lost in the beautiful Australian landscapes. Time danced by, and about 6 hours, 2 rest stops, 1 self-timer photo, and a bottle of caffeine later I ended up inland from Coffs Harbour, at a place called Never Never. “Never Never”. It sounded daunting just to say the name of it. Being a 20 year old girl travelling alone, there is a constant choice as to whether you let fear into your mind, or not. I always choose to block it out. I didn’t want to think of it on this trip. All I wanted to do was come to a point of completely embracing what was actually around me. After cooking a light meal on the stove top, I jumped onto the roof of my van and lay down, staring into the star-lit sky, in complete awe of just how small I was. Not one sound of humanity, just nature, I looked up in wonder and grew more excited for what I was about to experience, who I was going to meet, and what I would learn along the way. I woke up to the most stunning display of colour in the sky, packed a little bag and headed into the bush surrounding my van. Walking through the most vibrant green rainforest, everywhere I looked there was life in it’s most natural form. Hearing running water, I remember being so excited, sprinting in the direction of the sound to find the coolest little waterfall. I was surprised that it was so small but completely amazing and couldn’t help but wonder at how this beautiful little thing was right here, just for me to enjoy. It blew my mind. The only drama when travelling by yourself is that whenever there is a moment for a photo, you can’t take it without making yourself look stupid by taking a “selfie”. So, I set up my phone on the flattest rock I could find and took a self-timer shot. I had to have a memory of this little piece of art. Leaving there, I found another 2 waterfalls by the day’s end. A day of complete adventure, finding some of Australia’s most secluded spots. At the bottom of one of the waterfalls I found myself completely breathless, speechless, wordless by what I was experiencing. The only thing to come out of my mouth was this yell of excitement and awe at what I was seeing. The days flew by, and I was finding more and more peace wherever I went. Heading north for a fair few hours, I crossed the border into the QLD and ended up at a friend’s house on the Gold Coast (the current World Champion of long boarding, may I just add), just in time for Christmas eve. That night, I lay there in my van, looking up at vibrant blue fairy lights shaped as a peace sign, trying to still my thoughts from sending me crazy. In this moment, I thought, “Why am I rushing to the next spot? Why am I trying to see so many different places, without completely embracing the last, seeing it for ALL it has to offer, instead of just the main attraction?". I’m glad this thought came to me so soon, because from that moment on, the whole trip changed. I started to just sit still and embrace. I found more peace that I had ever imagined, making every magical place I found so much more meaningful, and utterly mind-blowing. I spent a week on the Gold Coast, being completely astonished at everything, and took time experiencing things. It was a jam packed week of surfing and sharing amazing moments with amazing people, constantly making new memories with new people, and more memories with the people I already new. Starting the New Year off with nothing but pure happiness, and still having three weeks left on the road, I left the Gold Coast and headed north. Setting up camp on a mate's property late arvo, I decided I'd use the two magical trees beside my van as holding posts for my slack-line, and put my right roping skills to the test. Not being any bloody good at it, I stopped after about an hour of pure persistence, absolutely stuffed, ate a peanut butter sandwich, and hit the sack. Waking up, I opened my door to the smell of green trees on a damp morning, and only 1 thought came to mind, PANCAKES! Being a little kid at heart, I put some music on and was amused for a while, trying to flip the perfect pancake. I messaged my friend Louis, whom I had met on past travels, and we decided to go see what Noosa was providing on the waves front, and pulled up to see the smallest little lines coming through. We decided to go get a juice and wait for low tide. The wait was worth it, as we returned to see the sickest little lines coming through and we were out there. We had what felt like a week straight of non-stop surfing. Noosa got better and better as the days went on, and I spent 5 days with the biggest legend out, just listening to his stories, sharing his wisdom, and creating a friendship like no other. I couldn’t have picked a more talented person to hang out with. I was able to be a part of his photography, listen to his amazing music, share endless laughs, and surf with such a legend long boarder. I was having an absolute ball. Leaving Lou’s after the best week ever, I headed inland, taking with me a Spanish traveler I had met along the way. We set of for a few hours, getting to know one another and sharing stories of places we had traveled. He told me he hadn’t seen much of Australia since he’d been here, only Noosa. And so, I made it my decision to show him as much as I could in one day. Out first stop was Budgerim Falls. A little waterfall just a small detour away from our route. We ended up at 3 different waterfalls and finished the day off with a challenging but rewarding sunset climb up Mt Tibrogargan. A mount with no walking track, just rock face. My Spanish companion turned to me and said in his broken English, “This is a day in Australia that I will never forget.” It made me so incredibly happy to be able to open up a new dimension for the world to someone. To be able to experience it for the first time with him kinda made it feel like a first for me, too. Sitting on the top of that mounting, looking out over so much, I just couldn’t be more thankful for the world I live upon. After a few days travelling around the hinterlands, I found myself returning south. Realising I was on the last leg of my trip, and in complete awe of what I had experienced already, I thought, “Could it get any better?" I spent the next few days alone on the road. Travelling around, discovering more unknown waterfalls and exploring new places the whole way down the coast. I adventured through the National parks, found time to relax, read books, and even do a bit of fishing. My trip ended as it had begun. Just me, my van, and an open road. I was returning home. I was returning to the life I had set out from, only now, it felt different. I wanted adventure, and found it. I wanted true serenity, and now have it. I am different, and that mystery is not as mysterious to me anymore. It is a full life. Madison "Mad" Jeffrey hails from whatever spectacular corner of Australia her van adventures take her. (We estimate she's somewhere near Crescent Head, NSW right now, most likely scoring great waves without us). When she's not 'on the road', Mad can be found in Sydney's northern beaches and is always up for hugs, laughs, and any adventure you're game for. You can follow her adventures on Instagram @madisonjeffrey. ROAR: You are on a fantastic adventure driving on the Pan American highway. For people that don't know much about it can you tell us what it involves and where it goes? TIM: Sure, the Pan American highway is one of the longest roads in the world (about 30,000 miles) and connects almost all countries of the Americas, from Canada to Argentina. It starts in freezing Alaska, goes through hot and humid Central America, over the Andes, until it reaches the again freezing Patagonia. It is only devided my a ~100mile drug mafia infested jungle between Panama and Colombia that is not drivable. In one sentence it's an adventure from start to finish. While I'm not always on the Pan Americana itself, but branch out to explore more of the countries along the way, I'll keep coming back to the road again and again, as it is the lifeline that runs through the continent. ROAR: So why did you want to do this trip? TIM: I started overlanding right after college when I drove across California for a month or so. The freedome to go everywhere got me completely hooked to explore the world on 4 wheels. Therefore buying a car and going south on the Pan Americana was the logical next step to my previous travel. In addition I had never been to south america before, but had heard and read a lot of great things about it, especially with regards to surfing! Lastly I always wanted to learn Spanish, so I decided to throw myself right in there and see what I pick up along the way. ROAR: What have been some of the best parts of the trip so far? - Surfing in Central America. Nothing beats surfing perfect empty reef breaks while only wearing board shorts. - Mountain trekking in Colombia. Being alone with the mountain is one of the most humbling experiences there is in my opinion. - All the friends I've made along the road. Can't thank everyone who helped me enough! Old and new friends have made this journey what it is and have allowed me to get where I am now. Manny thanks for that. ROAR: Are you doing it solo or with friends? TIM: I drove most of the trip solo, however never really felt alone as I constantly meet new people along the way (via instagram, by pure chance, or long planned in advance). My brother has joined me for some surfing in Costa Rica and Panama, which definitely was an epic time, and I'm super excited when I can finally pick up my girlfriend in Quito at the end of this month, who will join me for the rest of the way down south! ROAR: What type of work allows you to do such an awesome adventure? TIM: I work in consulting. As my work is soly project based, I could convince my employer to grant me a 6 month sabbatical. However I'm convinced that many people could get out there and do it, if they'd really wanted to. Many of my friends in the US switch jobs at least every two years, why not take some time in between? ROAR: What's next for you when you finish?